Last week I attended St John’s week-long launch of their Virtual Reality first aid experience. The event took place right in the heart of Perth in Yagan Square. Our team at emergeWorlds in Brisbane had helped out on the project so I was keen to see the culmination of many hands and much hard work. Upon entering the square I was struck by the great job St John had done in preparing and promoting the launch. The city was covered in St John’s red and white. Stickers of M.I.A. (Medical Information Assistant) were scattered around the square guiding the public into the main tent. Once inside the main tent, the public was given the opportunity to try out both the mobile and VR version of the game. Many people had never tried Virtual Reality before so starting them off on the I-pad was a nice way to lead-in to the main VR experience. It’s worth noting that, while everyone was keen to try, children were by far the most eager and fearless! St John had several setups on display. There was a screen-shrouded booth designed for ease of setup and mobility. For example, packing the whole booth into a car or van and heading out to schools or workplaces. In addition to this there was also a ‘pod’ designed as a more permanent solution. These had an amazing fibreglass design with futuristic lighting built into the main structure. Wired into both was a premium VIVE headset with cables strung above for ease of player movement. 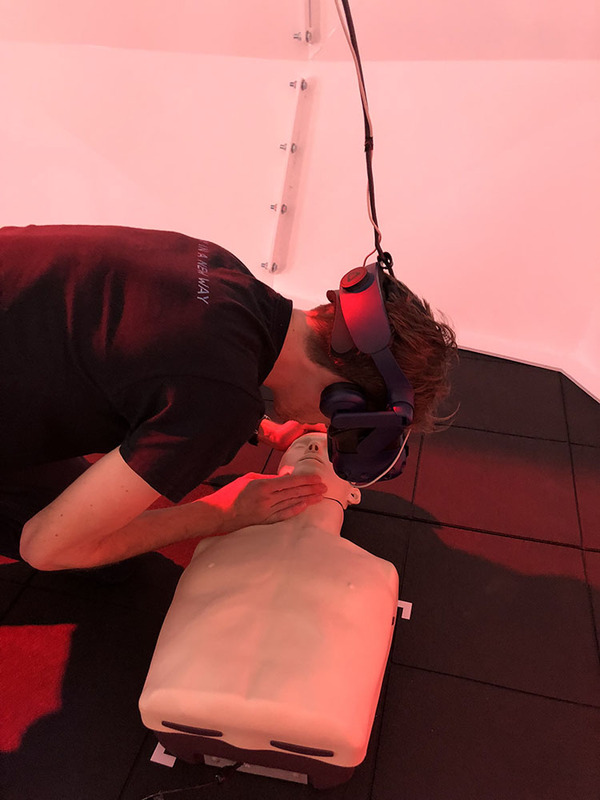 The experience makes use of a CPR manikin with sensors hooked up to the app to register speed and strength. It was a first time for me using these so I was not sure what to expect. The setup also does away with controller input and instead people are able to use their own hands via Leap Motion sensors attached to the front of the headset. This really took the experience up another level. By relieving user’s hands of controllers they become freer to play and experiment. Nothing demonstrated this more than an 84 year old lady who had ‘popped in’ to learn first aid. In her words “it was just something she had always wanted to do”. I was led through an orientation phase by M.I.A. the robot. She’s cute as can be and it’s no wonder she’s become something of a mascot for this whole project. After learning the initial timing and sequence of CPR I was prompted to try out my knowledge on an ‘emergency scenario’ where a woman had collapsed and needed assistance. Putting into practice what I’d learned, I delivered 30 strong chest compressions followed by 2 breaths to the patient. (I was surprised at how forcefully I had to thrust down on the patient’s chest!). Having successfully revived my virtual patient I was awarded with a “golden M.I.A.” trophy for my efforts. Far from being simply “another VR training app”, the experience embraces its game design origins and really wants users to have fun as well as learn. Being guided by such a charming narrator only makes this easier! Upon finishing the experience and removing the headset I was struck by the feeling that I’d taken part in something very special. Something that had gone way beyond being simply ‘instructional’ and combined world, character, narrative and technology together in a seamless blend. But perhaps the most amazing take-away from these two days was the fact that I now know how to perform CPR. Both in theory and in practice. My body has experienced giving the compressions. My chest and arms remember the way it feels to thrust down with force. My eyes remember the sight of the unconscious patient and the weeping girl beside her. My ears remember the sounds of the life-giving breaths I’d made. I’m not sure how many other people passed through the St John tent during that week. But I’ve no doubt they came away with similar feelings. Truly an honour to have been part of this!